Field-applied thermoplastics – ready for primetime? One of the benefits, and pleasures, of providing highly technical, vendor-neutral corrosion mitigation and optimal material selection consulting, is that we stumble upon new products all the time. CCG is fortunate to work in a variety of spaces. In the past month, we’ve remediated a failed floor coating system for a switchbox module for a major utility, provided support for passive fire proofing failures at a refinery, consulted on one clarifier, inspected another and just provided a proposal for identifying optimal materials for lining the interior of a 200’ tall smoke stack. But the most technically interesting project I’ve worked on in a very long time was of a simple swimming pool on the top floor of a high-rise in Chicago. The pool was originally lined with a 100% solids epoxy roughly 15 years ago. 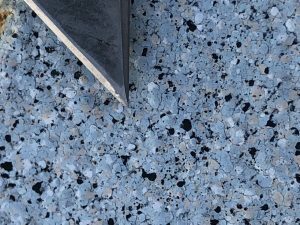 Last summer, a contractor came in, blasted off all of the coating and applied a field-applied, thermoplastic coating system. The reason we were called in was because the coating system was distressed- exhibiting rust spots through various areas of the coating system. The problem, we concluded, was applicator error – an easy determination and simple fix. But what was of most interest was that this was the first time I had ever seen a thermosetting material applied in the field. And, had the application been carried out properly, the coating system would have looked pristine. I have been waiting, and wondering, when thermoplastic materials would be developed for field application. Why? Because the potential is awesome, cool and deeply profound. Thermoplastics, in this case, are those materials which can be melted, applied to a substrate, and then be melted again – think of candle wax. Why is this upcoming technology so intriguing? Because plastics can last forever – just think about the world-wide problem with plastic water bottles. Those darn suckers are everywhere and take hundreds of years to breakdown. In the case of the rusting pool, we are unaware of the exact thermoplastic polymer material used, but the specifics don’t matter. What matters is that the technology is here. But is it ready for prime time? Thermoplastic materials are exceedingly well understood. Years ago, we lined the interior of large silos containing thermoplastic beads (polystyrene) used for injection molding (picture the ubiquitous college red-solo cup). Photo 1 – Tip of knife shows size of small, splatters of uniform and overlapping thermoplastic materials. The problem in field application is you have to inject your powder or otherwise chopped up plastic into a flame – and use air to “spit” it onto the substrate. And using live, flame on a thermoplastic changes the material due to the inconsistent heating and infusion of oxides and other contaminants from combustion into the thermoplastic. It’s a complicated stew of flame, heat, plastic, compressed air and technical skill. In the case of the swimming pool, you can see in photo 1 that the surface of the thermoplastic is relatively smooth, and you can see the individual “splatters” of the plastic material having been deposited onto the substrate, and built up onto itself, like dripping wax from a candle onto a piece of paper over and over again. Photo 2 -Tip of knife shows small spherical clumps of not-fully melted material, leading to Holidays and rust bloom. 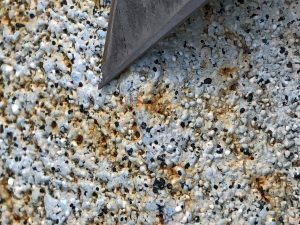 In photo 2, where there are rust spots and what appear to be Holidays, you can see that the material is more spherical in nature, likely due to the applicator being too far away from the substrate, and allowing the plastic to cool too much, and start to get hard, on it’s way to the substrate. So instead of melting onto the surface, like candle wax. It splattered, more like gum. I’m not prepared to say that this is revolutionary, but it’s close. IMHO, it’s the most profound jump in corrosion mitigation technology and beautification materials I’ve seen in years. It has potential application for bridges, exterior structural steel and, even, potentially, internal tank lining. We are working with a local contractor in trying to understand and develop the technology for further field applications. If you’re interested, give us a shout. Not sure ready for prime time due the rapid chilling in northern climates for 3-6 months a year..
Hi Trevor. Thanks for taking the time to respond and excellent point! But cold weather is a challenge for thermosetting materials as well. We’re consulting on a large (220′ diameter) clarifier which needs to be internally coated in the fall. Due to weather and temperature constraints, we’re going to have to tarp and DH/heat the interior shell. My thoughts, which need to be vetted, regarding thermoplastic materials is that the substrate, even at 72F, is “cold” compared to the temperature of the molten plastic. I don’t know yet if a colder substrate, say, 40F, will be good or bad for the setting of the thermoplastic. The other issue we’ve come across is adhesion, which is why primers are being looked at to promote adhesion. Many unknowns, but I think it’s promising. No cure-time, Inert, high-production rate, durable.